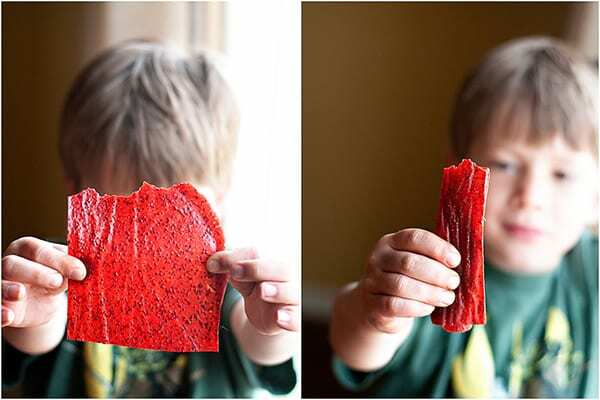 Strawberry fruit leather is a fun and healthy snack that provides nutritious vitamins kids need in a fun little roll that they’ll love. Fruit roll ups are perfect for an on-the-go snack or an addition to any lunchbox, you won’t believe how easy it is to make! This time of year tends to lean toward craziness. With the school year winding down, the calendar is full of activities that have my family on the run most days. I love all the activity of ball games, practices and school programs, but it does become difficult to keep up with the demands of the family, job and house. It forces me to be a bit more organized, planning meals and making sure I have snacks on hand to grab as we run out the door. I love using fresh fruit that is in season to make fruit leather (homemade roll-ups anyone?). It requires a bit of time, but I assure you it is worth it. By using strawberries, what is in season right now, gives the fruit leather an extra bit of natural sweetness. Feel free to substitute with other berries and fruits. You can go based off of what’s in season at the time, or simply your child’s favorite fruit. Add a touch of honey for a little more natural sweetness and you’ll have a great fruit strip snack for the kids to take to school or to have at home. This is an easy snack to have for when you are on the go, or for an extra special lunchbox treat. Why give your kids fake fruit leather with loads of sugar and artificial colors? Whipping these up takes no time and the oven does the rest. Can you make fruit leather with frozen fruit? My boys love this homemade version of the fake fruit roll-ups. Don’t have fresh fruit? No problem! You can definitely use frozen fruit. Let the fruit defrost in the fridge or on your countertop and then you can make the frozen fruit leather the same way you make it with fresh fruit. So easy. When making strawberry leather, you can even make the recipe seedless by passing the pureed berries through a colander before baking. 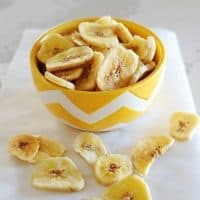 It might seem complicated, but this is actually one of the easiest homemade snack recipes you could make for your kids! All you need is parchment paper, fruit and a tiny bit of honey! It does require spending a lot of time in the oven, so make sure you plan to make your fruit leather on a day when you’ll be home for a good stretch of time. Watch this video to see how easy it is to make fruit leather! ﻿ You’ll start by chopping up your fruit. Then, puree it in a blender and add a little bit of honey. If you are using juicy, fresh fruit that’s already sweet and in season you won’t need much honey, the fruit will be all the sweetness you need! Line your baking sheet with parchment paper, spread the fruit mixture onto the paper until smooth and bake it in the oven. After the fruit leather bakes and cools, you can use kitchen scissors to cut the leather into strips of fruit. Then you simply roll it up and tie it with a bow. This always looks adorable in lunch boxes and the kids are so thrilled to see a favorite snack and it’s something I feel great about giving to my kids because it’s made with fresh, real ingredients. 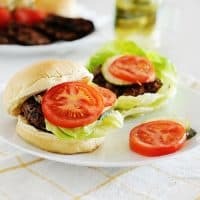 I know how hard it can be to find those recipes that are made with fresh, whole ingredients that kids will actually eat. 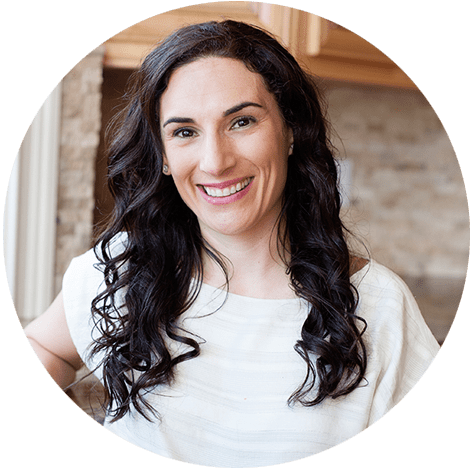 If you are looking for more solutions just like this one, check out my free resource that will help you eliminate all processed foods from your family’s diet for 30 days straight. From meal plans to recipes and even shopping lists, I have you covered and every bit of it has been picky-eater approved! Click here to start eating better as a family today! Okay, back to our fruit leather. I’ve laid out everything you need to know to make homemade strawberry fruit leather, but you can definitely use the same measurements with the fruit of your choice. Which fruit will you make with your kids first? Easy homemade fruit leather recipe made with strawberries and honey. No sugar added fruit roll ups for the perfect afternoon snack. Preheat oven to 150 – 200 degrees Fahrenheit. Line a baking sheet with parchment paper. 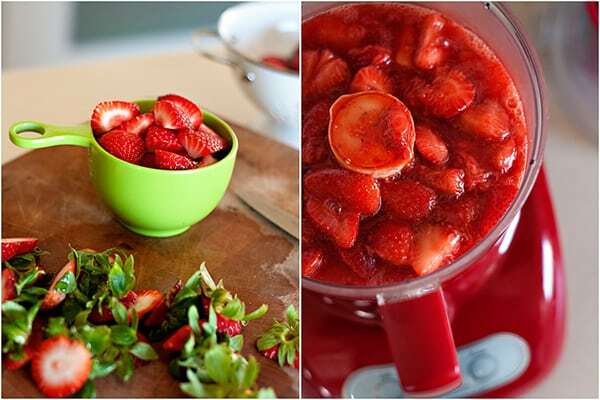 Pour berries and honey into a blender or food processor and puree until smooth. Pour berry mixture onto parchment lined 9×13-inch pan(21cm x 31cm). If you wish to remove the berry seeds, pour it through a sieve or ring it through a cloth (much faster). Spread the berry mixture with a spatula to a thin even layer. Bake for 6 hours, until leather peels away easily from the parchment. Set on the counter to fully cool down for 4 hours or overnight. Using scissors cut the parchment paper from the edges and then into strips. Roll them up, parchment and all. Don’t pour too thin of a layer or you’ll have fruit crisps instead of fruit leather-pour it too thick and it will take longer to leather. Oven temperatures will vary. Start checking it after 3.5-4 hours. If you leave it in too long again…fruit crisps. After i cook this fruit leather and i cut it into strips for snacks later, how can i store them , and for how long? in an airtight container or zip bag for 2 weeks. Enjoy! That might take a really long time to dehydrate. I’ve never tried it that thick. Thanks for the insperation, these are going to be so delicious! No this only works with parchment paper. Could I use quilon paper or is that along the same lines as wax paper? Can you explain why you have to cook the fruits? Is there a reason you could not puree the fresh fruits? Making “fruit leather” is dehydrating the fruit. The “leather” texture is achieved when you take out the humidity/water content from the fruit. You aren’t really “cooking” it at 200degrees. If you puree fresh fruit you have…. fruit puree. He was asking about dehydrating cooked vs raw fruit puree. I’ve never tried it with raw fruit, but I’m seeing lots of recipes online that don’t require cooking. Try it both ways…Good luck! I am really itching to try this, but I was wondering the steps for using frozen fruits instead of fresh. Also, some recipes say just blend and bake, but some say to cook it first, so I am curious as to why we have to cook it. I have a confection oven, so I’m hoping it wouldn’t take as long. Wish me luck! you can just blend and bake using fresh or frozen. when you use frozen strawberries the water content is high, so it will take a longer to dehydrate. Can this recipe be used in a food dehydrator? Absolutely. It takes about 24h in mine. I just made the Apple Cinnamon Fruit Leather from your Best Homemade Kids’ Snacks on the Planet book. I had the puree in the oven at about 175 for 11 hours. I used a 1/4 sheet pan with parchment paper and they come off the paper without any trouble. A bit tough on the edges, but perfect texture in the middle. Great flavor and the kids really like it! Just took lots of extra time. I’m so glad it was a success! perhaps it was poured a bit thick? I used a siltpad and then transferred the finished product to a piece of parchment paper and it came our great. I also cooked the the berries and added a little bit of sugar while cooking as they were really tart. Cooking them beforehand helped cook off some of the moisture in the berries and took less time in the oven. I simmered them for approximately 35 mins they reduced to about half. I pureed the fruit after it cooled a bit and I also made sure the puree was 1/4″ thick when I had spread it out on the pad, otherwise if they’re too thin and it turns into a fruit crisp or stuck the parchment when I used parchment. I added sugar and it burned at 2 hours, can you not add sugar? Sugar will burn. The recipe calls for honey, it has different cooking points than sugar. I had the same trouble as Zoe. I couldn’t get the leather off the parchment. Had to throw away 4 pans of apricot leather. So discouraging! did you use parchment or wax paper? the recipe only works with parchment. And in a dehydrator, how many hours and temperature? I dont’ own a dehydrator but this is a good resource to check. Just tried this recipe but–oh so sad!–what we managed to peel off the cookie sheet was so stuck to the parchment paper I ended up throwing it away. Anybody else had this problem and what to do? I’d like to try again because it tasted awesome, but don’t want to waste more strawberries! Zoe, did you use non-stick parchment paper or wax paper? Please the box. The recipe will melt to wax. Use Silpat sheets. My fruit leather turned out a little thin, but it came off really easily. Just need to make it thicker next time. Also, I used honey, I read somewhere you can also use corn syrup but sugar may crystalize. I dont have any honey . Is there an alternitive?? Or can I make it with out honey? You sure can make it without it. I just made these, one with blueberries and one with peaches. The blueberries took a good 7 hours in a 170 degree oven (as my oven will not go any lower) and were still a little wet underneath, but the top firmed up nicely. The peach is a different story, however. It went in at the same time as the blueberry batch, and 7 hours later still hadn’t set up. I finally just pulled it and scrapped off the peach puree and decided to freeze it to make peach muffins at a later date. Why do you think the peach would not set up? Sara, the only thing I can think of is that it was set too thick on the parchment paper. Every oven is different and in mine it takes about 4-4.5 hours while at my parent’s house only 3.5! Have you frozen these? We were given some fruit leather once that had been frozen. I tried to get the recipe but it was from a friend of a friend and I was never able to connect with her. Would love to make this during the summer and have for lunches this fall. Janice, I’ve never frozen this recipe. It usually doesn’t last long enough! I imagine that it shouldn’t be a problem. If you try freezing one batch, will you let us know? Once the fruit leather is made , it can be frozen for longevity. Oven times will vary. It also depends how thick your ‘leather’ is. don’t get discouraged! lovely ! Pinned it !! Looks so yummy. Will try it over the summer when we go berry picking. What other fruits work well ? have you tried others ? Jen–Store them in an airtight container and they’ll usually last about a week. After that, they are a bit too ‘leathery’.